If you have not had the experience yet of the college application process for a child in today’s world, you are bound to be surprised when you do. Unlike the applications of my day, students now are asked questions which, to me, seem a bit odd. “What your favorite website is.” Presumably, colleges believe this is a window into a part of the students’ lives, an indication of what they enjoy, an inkling of where their time is spent…. Maybe? “How did you spend your summer?” Another question probably designed to give insight but reminds me of those first week of school essays assigned in elementary school. But my favorite: “If you had to pick an image that best represents who you are, what would it be?” As you can imagine, my daughter came downstairs from her room for that one. Out of the mouth of babes, as they say…. I am famous for my to-do lists. Every project I work on, every task for the organizations I chair, every time we travel, every coordination email I send, every event I cater, every birthday party planned… literally everything I do is organized by a to-do list. 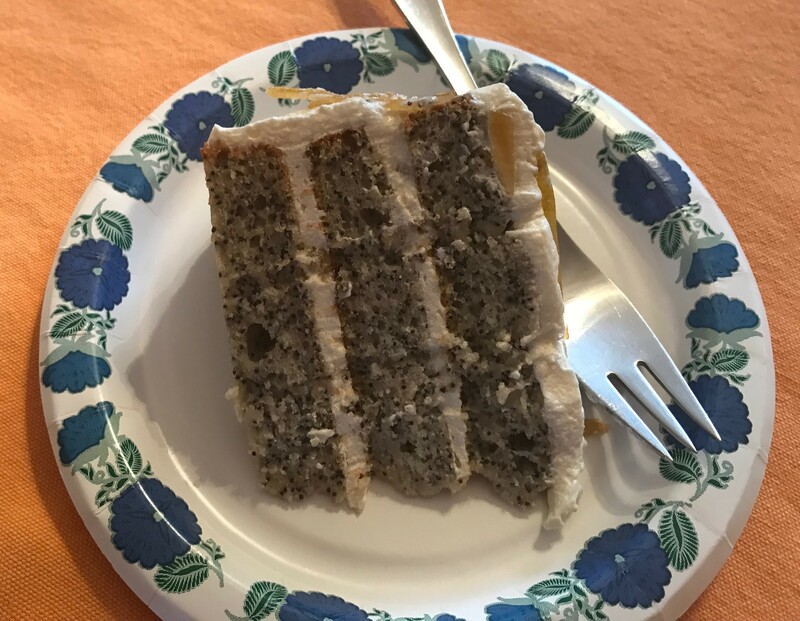 This week on my to-do list was to bake a poppy seed layer cake for a luncheon my husband and I had been invited to attend. As I rummaged through cook books and googled online recipes, I noticed that while a myriad of recipes existed, they all seemed to use a lot of butter, shortening, eggs, and/or cream cheese or sour cream, all of which are high in saturated fats and cholesterol which I wanted to avoid in addition to, of course, making the cake gluten, dairy, and nut free, so I, too, could enjoy it. This meant rethinking a few things. So, the first thing I did was opt to make a lemon poppy seed cake, because the lemon would flavor everything and reduce the need for flavor from butter or cream cheese or sour cream. The second thing I did was choose to use egg whites instead of whole eggs. The third decision was to make a “buttermilk” out of soy milk and lemon juice to replace sour cream or cream cheese in the recipe and to cut the amount to 1/2 cup. The fourth change was to use olive oil in the cake with its good fats and a vegan olive oil butter for the frosting which had a little saturated fat but much less than butter and far more good fats. And as always, I did what I could to cut the use of sugar, confining it to just the frosting. The result was a delightfully light tasting cake which all enjoyed. 2. Mix the flour with baking powder, baking soda, and salt. Add the truvia and poppy seeds. Set aside. 3. Mix oil, Agave, buttermilk, lemon juice and water. Set aside. 4. In a large mixer, beat the egg whites with the cream of tartar with the whisk attachment until thick, white peaks form when you lift the whisk. 5. Mix the dry ingredients into the wet ingredients. Combine well until the dry ingredients are completely moistened. Batter will be thick. 6. Gently fold the beaten egg whites into the batter, a little at at time, until all the egg whites are fully incorporated into the batter. 8. Cool on the cake layers in their pans until completely cool. 9. Frost the layers with the lemon frosting below, and store in the refrigerator until close to serving time. Let the cake come to room temperature before serving. Enjoy! Whisk together the sugar, flour, cornstarch and salt in a pan. Whisk in the “milk” until smooth. Over low heat, stir constantly until the mixture begins to boil and thicken. Depending on how shallow your pan is, this will probably take about 4 to 8 minutes. Once the mixture is thick, pour the mixture into a shallow glass container to cool. I find that a glass pie pan works very well. It usually takes an hour or more to fully cool. Once the mixture is cool, in a mixer, beat the vegan butter until light and fluffy, and then scrape down the sides of the butter. Add the cooled mixture with the vanilla and beat the frosting on a low speed to incorporate the mixture into the butter. It will look a bit curdled. Scrape down the sides. Increase the speed and beat until the mixture looks like a light and fluffy frosting. Its texture and taste will be similar to a whipped cream frosting.